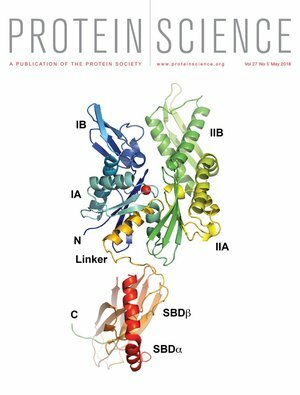 Bringing Computational Protein Design Into the Future. 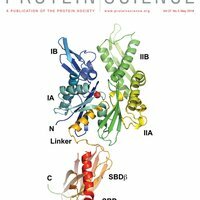 A Modern, Open Protein Engineering Database. 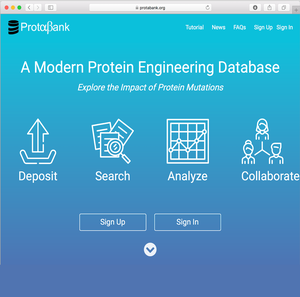 Powerful Protein Design behind a Sleek Web App. ProTherm, the thermodynamic database for proteins and mutants, is the largest source of thermodynamic protein stability data, containing over 25,000 entries. Although the ProTherm website is no longer being supported, we are providing continued access to this valuable resource by incorporating the ProTherm data into ProtaBank. All the entries have been converted to the ProtaBank study format using automated scripts. For the raw ProTherm data, access to these scripts, or more information, check out our github at https://github.com/protabit/protherm-conversion. The National Institutes of Health awarded Protabit a Phase II SBIR grant to continue development of their protein engineering database. The database will provide a central repository for all types of protein engineering data spanning a wide range of protein properties. The design features a standard format for reporting mutant protein sequences and experimental assay data that will facilitate comparison of results across different data sets. A suite of analysis and visualization tools will be provided to support discovery and guide future designs. 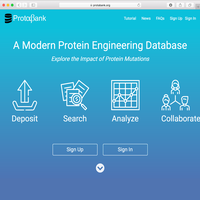 Having large amounts of protein mutant data in an organized, searchable database is expected to facilitate machine learning and data mining, help scientists gain insights into sequence-function relationships, and support the development of new predictive tools and algorithms. More on this award can be found at SBIR.gov. The National Institutes of Health awarded Protabit a Fast-Track SBIR grant to develop a database for protein engineering (PE) data. The database will provide a comprehensive central repository for all types of protein engineering data spanning a wide range of protein properties. It aims to provide an industry-wide standard format for PE data and a suite of analysis and visualization tools to support discovery and guide protein design. The database will help facilitate machine learning and data mining approaches to protein engineering, support the development of new predictive tools and algorithms, and help scientists gain insights into sequence-function relationships. 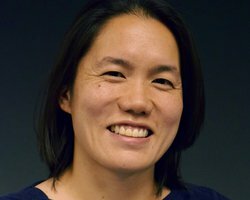 The National Institutes of Health (NIH) has awarded a Phase II Small Business Innovation Research (SBIR) grant to Protabit to continue development of Triad, their web-based software for computational protein design and engineering. By combining automated workflows, interactive analysis and visualization tools, and the convenience of cloud computing, this NIH support will allow Protabit to further their goals in making cutting edge protein engineering software easy to use and accessible to bench scientists. 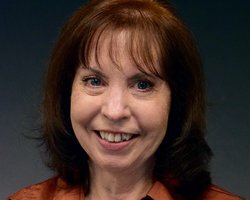 This NSF Phase II STTR award will allow Protabit to develop a computational protein engineering (CPE) "platform technology" that enables new products and techniques in a wide range of scientific areas, including industrial enzymes, pharmaceuticals, therapeutics, medical diagnostics, and bioenergy. In collaboration with the Mayo lab at Caltech and the Rosenzweig lab at Northwestern University, Protabit will build on its Phase I efforts and validate the CPE platform by engineering a solubly-expressed methane monooxygenase (MMO) with improved methane-oxidizing activity. An additional goal is to work with potential licensees of this technology to incorporate the engineered enzyme into their industrial host organisms, thereby allowing them to use methane as a feedstock for the bio-production of a wide range of end products, including liquid transportation fuels, commodity chemicals, and high value fine chemicals. 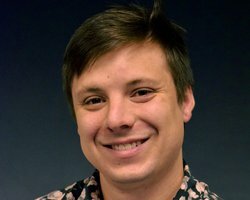 Protabit is preparing to release TriadWeb, a web-based, protein design service built upon Protabit’s Triad software platform and utilizing the Amazon Elastic Compute Cloud. This service is designed to be simple, secure, user-friendly, and reliable, making it easy for bench scientists to execute protein designs and translate them into protein variant libraries that are easy to construct and express in the laboratory. For now, TriadWeb is available for trial and subscription by invitation only. If you’re interested in learning more about TriadWeb and being included in the next group of trial customers, please submit your name, organization, and email in our contact form at the bottom of the page. 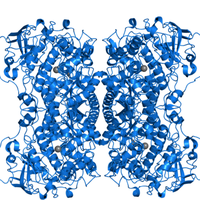 PASADENA, CA (PRWEB), February 04, 2015 — The National Institutes of Health (NIH) has awarded a grant to Protabit LLC to make its commercial-grade computational protein design (CPD) software platform, Triad, available to subscribers as a new software-as-a-service. Engineered proteins are used as antibody-based human therapeutics, in microbial pathways for the production of bio-based fuels and chemicals, and in numerous other applications. Current engineering methods rely heavily on large-scale screening in the laboratory. 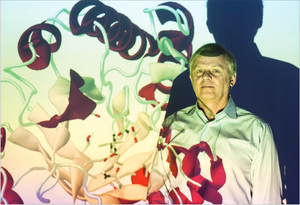 Triad speeds the discovery of new or enhanced proteins by using computer modeling to focus screening efforts on amino acid sequences that are most likely to be useful. The core technology for Triad was developed over the past 5 years in partnership with Monsanto and the laboratory of Stephen Mayo at the California Institute of Technology, and it features cutting edge protein design, modeling, and analysis tools. Current CPD platforms are powerful but complicated and difficult to use, and they require costly computer systems to execute the intensive calculations required for protein design. The objective of the NIH Small Business Innovation Research (SBIR) Phase I project is to make CPD broadly accessible by harnessing the power and convenience of cloud computing. Protabit is developing Triad into a web-based, easy-to-use, collaborative CPD software application that is available by subscription, without the hassle of installing software or purchasing and maintaining expensive hardware. Triad will feature user authentication and encryption, secure data sharing, and interactive visualization tools. Protabit hopes for boost from licensees’ work with its program. Mentioned in the article are our partners Monsanto, Caltech, Northwestern University, and the Pasadena Bioscience Collaborative. A PDF of the article is available here: LABJ_Protabit_article. Protabit wins STTR grant to engineer bottleneck enzyme. Protabit has been awarded a DOE Phase I Small Business Technology Transfer (STTR) grant to engineer a more efficient dihydroxyacid dehydratase, a key bottleneck enzyme in the biosynthesis of isobutanol from glucose. Protabit is partnering with the California Institute of Technology on this 9-month Phase I effort. The team will apply computational protein design to engineer a cofactor swap, substituting a simple Mg2+ cofactor in place of a complicated, energetically expensive cofactor (Fe-S cluster). More on this award can be found at SBIR.gov: https://www.sbir.gov/sbirsearch/detail/687660. ARPA-E has awarded a $1 million grant to a team of scientists and enzyme engineers at Northwestern University, the California Institute of Technology, and Protabit LLC to engineer more efficient methane activating enzymes. The team is led by Prof. Amy C. Rosenzweig of Northwestern and includes the laboratories of Prof. Michael Jewett at Northwestern and Prof. Stephen Mayo at Caltech. 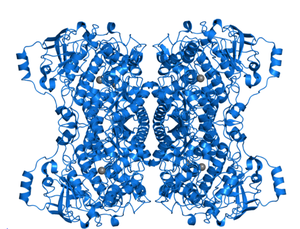 Protabit is providing the computational protein design software and engineering expertise. The objective of the 1-year effort is to develop efficient and versatile enzymes that can chemically activate methane, enabling the biosynthesis of liquid fuels and chemicals from natural gas. ARPA-E is providing funding for the effort via its Reducing Emissions using Methanotrophic Organisms for Transportation Energy (REMOTE) program. PASADENA, CA, February 6, 2014 — The National Science Foundation (NSF) awarded a Small Business Technology Transfer (STTR) Phase I grant to an industry-academic partnership led by Protabit LLC. In collaboration with the Mayo lab at the California Institute of Technology and the Rosenzweig lab at Northwestern University, Protabit will engineer enzymes that convert methane to methanol as part of a biosynthetic pathway that uses natural gas to produce fuels and high-value chemicals. Protabit will apply its computational protein design software to engineer improved MMOs. 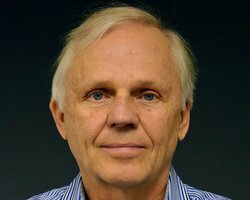 “Use of Protabit’s state-of-the-art computational tools will allow us to generate and screen libraries of novel sequences to rapidly identify recombinant MMO variants with the desired properties,” said Dr. Stephen Mayo, Protabit co-founder and Chair of the Division of Biology and Biological Engineering at Caltech. National Science Foundation Awards Phase I Small Business Technology Transfer Grant for Engineering Cellulase Enhancing Enzymes. PASADENA, CA (PRWeb), July 1, 2013 — The National Science Foundation awarded a Small Business Technology Transfer (STTR) Phase I grant to Protabit LLC, a Pasadena-based spin-out from the California Institute of Technology. The grant will be used to engineer cellulase-enhancing enzymes called polysaccharide monooxygenases (PMOs) for the production of biofuels from non-edible corn stover biomass. The abstract of the grant is available here: http://nsf.gov/awardsearch/showAward?AWD_ID=1332185. At the core of Protabit’s engineering approach is Triad, a computational protein design software platform that is used to generate new enzymes for experimental evaluation. Triad is the product of research by thought leaders in the field including Prof. Stephen Mayo, chair of the Division of Biology and Biological Engineering at Caltech and a co-founder of the company. For this STTR project, Protabit will apply Triad to generate libraries of possible enzyme variants predicted to be stable at higher temperatures; the team at Caltech will then produce these enzymes and screen them for the desired properties using robotics-enabled high-throughput techniques. PASADENA, CA (PRWeb), June 28, 2012 — The National Science Foundation awarded a Small Business Innovative Research (SBIR) Phase I grant to Protabit LLC, a Pasadena-based spin-out from the California Institute of Technology. The grant will be used to engineer cellulase enzymes for the production of biofuels from non-edible corn stover biomass. ST. LOUIS and PASADENA, CA., June 11, 2009 — Monsanto Company (NYSE: MON) and Pasadena-based Protabit LLC, today announced a two-year collaboration to develop new tools for protein design and optimization. All organisms produce a diverse set of proteins to express characteristic attributes, which in plants can include tolerance to drought and pests. Monsanto agricultural biotechnology researchers use high-throughput protein design and optimization technologies to rapidly design more effective proteins to confer beneficial traits in crops. Development of improved software tools for protein design and optimization can help shorten the product discovery process. This would enable Monsanto to more quickly identify pipeline gene candidates in support of the company’s sustainability goal of doubling yields in its core crops of corn, cotton, and soybeans by 2030, compared to a base year of 2000. Protabit is a start-up company founded by Stephen Mayo, PhD, of the California Institute of Technology. 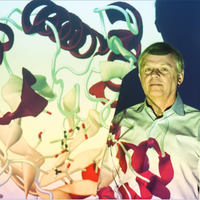 Dr. Mayo is a leader in the field of computational protein design and expects the software created by Protabit to have broad applicability as a protein improvement and discovery tool in biotechnology. Barry is a co-founder of Protabit and past founder of Molecular Simulations with William A. Goddard III and Stephen Mayo. 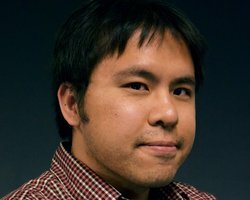 He has a PhD in computational chemistry from Caltech and was a developer of Charmm as an NIH postdoc in the Karplus’ lab. Paul is a software engineer who enjoys working on scientific applications. Paul received his SBs in Computer Science and Mathematics from MIT and his MEng from Princeton. Wes is a full stack developer and designer with 4 years experience at life science startups. He received his BS in Bioengineering from UCSD, MS in bioinformatics from Technion and self-awarded PhD in anime film history. 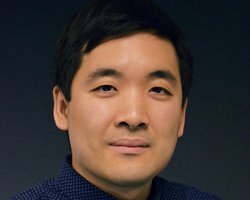 Shu-Ching is a computational chemist with expertise in protein modeling and free energy calculations. Shu-Ching received his B.S. and M.S. in physics from Tsinghua University, and Ph.D. in physical chemistry from University of Delaware. Please fill me out with some nice a thoughtful descriptive text about who you are and your path here! ©2018 Protabit LLC. All rights reserved.